Get your students excited for Winter before you send them off on break. The holidays are almost upon us, and that means two things, that you and your students get a nice long vacation and that winter weather is coming. Gynzy’s Winter Words and Winter Scene tools are the perfect way to channel all the excitement of this season, while also teaching your students new vocabulary and getting them to think critically and creatively. Gynzy’s Winter Words tool comes complete with four engaging activities to teach your students more about the vocabulary they’ll be hearing this season. The tool includes activities on matching words with their images, identifying words that rhyme, and identifying letters and counting the syllables of some new words. 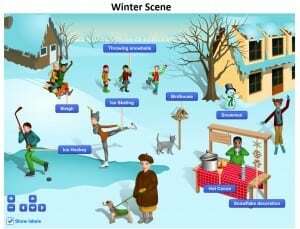 Let your students explore the interactive Winter Scene tool! Gynzy’s Winter Scene presents a beautiful snowy wonderland depicting people out and about enjoying a nice snow day. Students can click on any object or activity they choose to zoom in and learn more about it. This tool can be used as a great prompt for a class discussion or a creative writing activity.